The situation facing Nintendo for E3 2014 is a strange one. The company has been losing money for the past couple of years, and its flagship Wii U console has consistently undersold Nintendo's projections; even the 3DS has been slowing down. Sales of software have also been less than expected. On the other hand, Nintendo's in a good position to have a successful E3 show. Expectations are low, the company is saving money (and further reducing expectations) by not holding a press event. What can we expect to see from Nintendo at E3 2014? First, let's look at the landscape for Nintendo. The Wii U's sales are on track to be Nintendo's worst-selling console ever, and the situation is unlikely to change soon. The company is hoping to boost sales with Mario Kart 8 and the new Super Smash Bros., but third-party support is vanishing. Companies like Electronic Arts have no plans to put out Wii U versions of hit titles, and even Ubisoft (which has done very well with Wii titles like Just Dance) won't be displaying any Wii U titles at E3. Salvation won't be coming from third-party publishers. The 3DS, which has been performing well after a rocky start, is slowing down, and Nintendo predicts lower sales this year of the hardware despite the introduction of the $129 2DS last Christmas. Overall, then, Nintendo is looking at a difficult year for its hardware. This leads us to E3 2014, where Nintendo has (like last year) elected not to have a major press event, or even a presentation inside their booth as they did last year. Instead, the company will stage a Super Smash Bros. tournament and provide a Nintendo Direct video to fans everywhere. Essentially, the video will be Nintendo's press event, only produced in a carefully controlled environment at a considerable cost savings. What can we expect to find out from this video and from Nintendo's booth? Nintendo may have concluded that the Wii U in its current form is not going to be a hit, and that a new console is probably warranted. But creating new hardware takes time, and it takes even more time to create software for it. If Nintendo has learned anything about its latest hardware introductions, it should be that killer software needs to be introduced with the hardware. So we aren't going to see new consoles this year, unless perhaps it's a new color. "If Nintendo is really planning a new console, they might as well try to keep selling the current one as profitably as possible while the new hardware is under construction"
Don't expect Nintendo to cut prices on the Wii U or any of the 3DS line at E3. The company is already losing money on every Wii U sold, and cutting the price only means losing that much more. This might make sense if there was plenty of software to sell (generating profits to cover the hardware losses), but the Wii U doesn't have a vast library of software to sell. If Nintendo is really planning a new console, they might as well try to keep selling the current one as profitably as possible while the new hardware is under construction. Here's where Nintendo is likely to focus: New games, and adding features and services to existing products. We've already heard about Nintendo's plans to add near-field communication (NFC)-enabled toys to its line, and apparently some toys will work with Super Smash Bros. Maybe we'll hear about a new Zelda game, but there will certainly be other games announced. We may also hear about new services, changes to the eShop, and improvements to the Wii U software. Nintendo will be doing all they can to increase the perceived value of the Wii U, since they won't be reducing the cost. That means talking about upcoming games, of course, but it also may mean new features for console, new services, or bundling in software or other things to increase the value of the Wii U. Perhaps an NFC toy will be included with the Wii U, along with some demo software, to show exactly how much fun the NFC toys will be. Either explicitly or implicitly, we'll find out more about how Nintendo intends to market its products for the rest of the year. We probably won't hear about expensive TV advertising spend, but there may be more efforts with hands-on experience in stores (like the Super Smash Bros. demos that will take place during E3 at Best Buy stores). Nintendo will continue to use video to get its messaging out directly to fans, since that's inexpensive and effective at reaching the fan base. One interesting thing to note will be the relative attention given to the 3DS line versus the Wii U line. Which product line will get more space in the booth, or more time in the video? 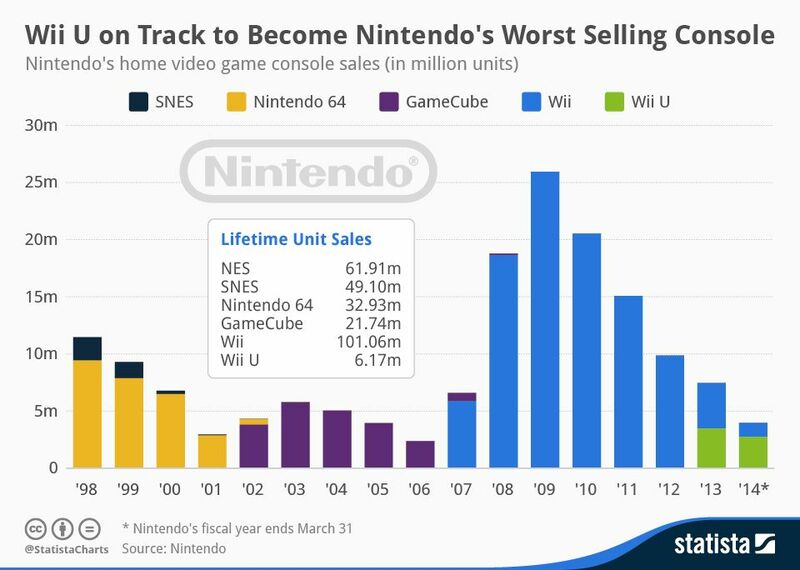 That will tell you how Nintendo ranks the importance of each console, and Nintendo believes the greatest sales and profit opportunity lies. Nintendo's prepared the world not to expect all that much at this year's E3, and thus any cool new thing they show will be seen as a win. Everybody loves an underdog, and if Nintendo can show some exciting new software on the horizon the media will give it a good play. Nintendo's not going to be hinting at any future consoles in order to avoid killing sales of current devices. We'll see more reasons to buy the current offerings, and we'll get a sense of where Nintendo is going to focus its marketing spend in the year ahead. Meanwhile, Nintendo is working on the new directions that its CEO Iwata spoke of (something to do with fun and health), but we won't know about that until some time in the future. New hardware will surely be on the way, but Nintendo would be wise to keep that under wraps until it's ready to sell with some great software along with it. For the time being, Nintendo will stay the course it's set, and try to make the best of what it has. We'll see if it's good enough to lift the company back into profitability, but we won't know that for quite a while. Republished from the [a]list daily. For more, read the [a]list daily and subscribe to the newsletter to get the latest in game and entertainment marketing news, cool videos, incisive opinions, exclusive interviews and industry data. "Sales of software have also been less than expected." But higher than everyone else. That must be said. 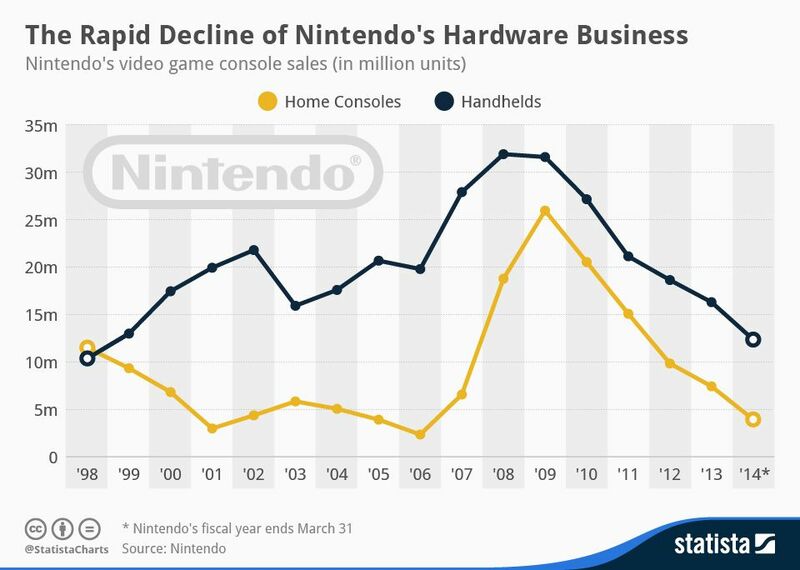 It must also be said Globally in 2013, Nintendo sold the most hardware, so things are not all doom and gloom. "The company is already losing money on every Wii U sold,"
This is no longer the case. Iwata said so last month. What I want to see is release dates. For the longest time Bayonetta, X, and Smash Bros. were coming out in 2014. At least Nintendo gave vague seasons for Smash, and Bayo is coming out "summer" in Japan. Before any new games are announced, give gamers the date they can buy the ones they've been waiting for since last years E3. Some people are getting tired of waiting. I just want them to drop the controller and give me my (less expensive) Wii 2. You want a second screen? Interface with phones and tablets, and create a good add-on controller for them. Granted, I would have liked something better, but a Wii U without controller pretty much gives me what I want: a replacement for the Wii that can run its games and give me new games of the same style on better hardware. Of course Nintendo will be working on new hardware - they almost certainly start sketching ideas for the next console before the last one is on shelves. They won't announce anything for a while though, since that would kill the current iterations off, and upset owners expecting a few more years of support. @Eyal - I don't understand the calls to remove the gamepad. Yes, you can argue against it being there in the first place, but removing it now would remove a lot of very useful features at the cost of fragmenting the install base; unlike the 3DS's stereoscopic screen, there are a lot of wiiu titles that would need patching at a minimum it the gamepad went, and the OS itself would need a complete rewrite. As it stands, the wiiu works fine as a "wii HD"
I really hope Nintendon't learns something from this on how not to run things software side. Big fans realize they take their time with key IP reiterations, but one can only wait so much. I unfortunately bought my Wii U at release (first time I've ever done something that crazy) and I truly regret those £330 just to play Windwaker HD and 1 session of Mario Bros U.
I had to sell it recently before it looses more value. I really can't have a £330 machine doing nothing while waiting for more promises of Kart 8 and Smash Bros - that aren't even my favorite Nintendo IP's. All things considered, I had a £300 console for Windwaker, I'm sorry Iwata, I just can't be arsed to wait any longer for something to come out eventually that will enable me to say: "I've spent £330 on that and it was worth it!" with a straight face and looking in the eye. Nintendo's long term direction is obviously being settled internally. Sibling devices that run the same development tools and OS with unified Network accounts, more thorough merchandising and utilisation of their IP, and a focus on quality-of-life entertainment (starting with health, moving into education) that protect Nintendo's finances when their videogame business encounters turbulence. In the short term, high quality software should take precedent. I can't see Nintendo have much beyond the already announced 2014 titles for Wii U: Hyrule Warriors, X, Bayonetta 2, Sonic Boom and Smash all need to be out by Christmas, along with whatever other support they can get, perhaps Yarn Yoshi will resurface for this year. Perhaps something like Mario Party or a Wii series game, or the rumoured Pokemon spin off will be confirmed for this year. Importantly, I think Nintendo need to have plenty of content announced for 2015; they need to prove they are still behind Wii U. They've said as much, but only by announcing 2015 software can they prove that they are sticking behind Wii U. Presumably Nintendo do have plenty of content ready to hit in 2015. Iwata said that this year's target of 3.6 million Wii U sales was conservative, and that this financial year would not be the peak for Wii U in terms of hardware/software sales, as is the norm for Nintendo systems. I'd guess that means whatever action Nintendo took early in 2013, when it became obvious Wii U would struggle and the system needed more software out, will only pay off from next March onwards. You can't produce software out of thin air, so it's reasonable to assume it's taking two years to get software (that wasn't initially planned, counting on third party support and stronger sales momentum) to market. Across both systems, Nintendo need to cultivate install bases that buy lots of software, which is where the real money lies. Continue to ramp up digital support, sort out Virtual Console, push some cross-buy incentives, make a big splash with the NFC platform, bring out Player's Choice ranges on both consoles and the eShops. Nintendo have a longer term plan in the works, and there's no point in rushing that. In the mean time, Nintendo will still have some of the best exclusives money can buy and an increasingly profitable handheld platform. It's not great for their short term financial health, but it is what they need for long-term stability. It's quite intriguing how much this would further increase with the release of Mario Kart 8 and hype for games like Zelda Musou, Bayonetta 2 and soon to be announced games. Games aside, although the Wii U is already a value-packed hardware, a lot of people still do not notice this given that up until now, it still remains a console that does not play Blu Ray movies. Nintendo needs to collaborate with a concessionaire like Panasonic to finally add this missing feature. Stand alone players are already affordable but there are a lot of people (The casual gamers mostly) who looks for this functionality in their new console. The original Wii doesn't play DVD movies but people found a way to do this. The Wii U Reads Wii discs so DVD movie playback is also possible. Andy, Nintendo only needs to sign a with the Blu-ray Association for licensing and then a firmware update will allow full Blu-ray movie playback. Their own disk drive manufacturer and disk creator is a member (Matsushita...now known globally as Panasoinc). Nintendo simply prefers not to eat the cost of this license instead of pass it onto gamers. Nor do they seem willing to sell a "movie remote" that unlocks video playback as MS did with the original Xbox (cost of the remote included the licensing fees...plus profit, naturally). Exactly Jim. People thinks Nintendo needs to revise the hardware but all it needs is a software/firmware update to get it to play Blu Ray movies. The GamePad already works as a remote so it would seem redundant to release a separate remote just like MS did. Nintendo needs to make these seemingly "unnecessary changes" to make the system more appealing to a wider audience who isn't solely focused on gaming. The age of a gaming only console is dead thanks to companies like SONY and Microsoft who continues to push their system as an entertainment hub. This gives me a feeling that Nintendo's new hardware after the Wii U will be the next "Super Nintendo Entertainment System".